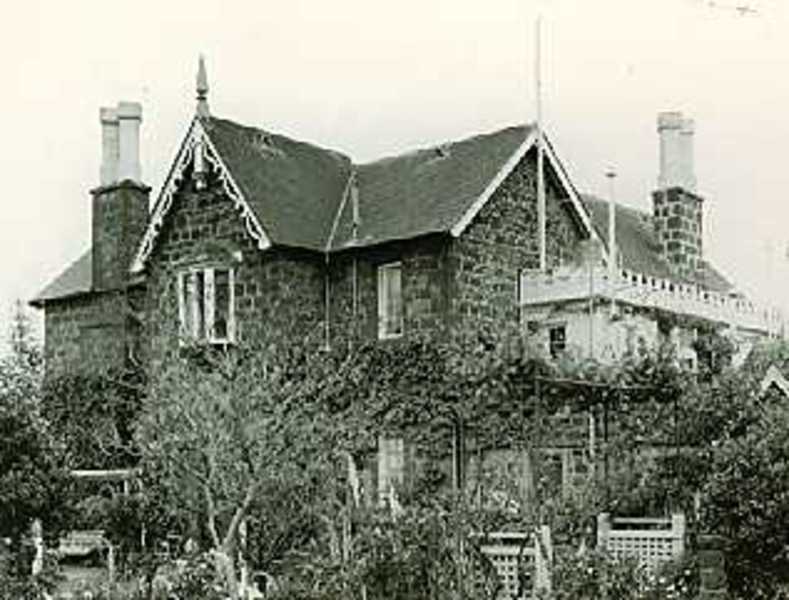 The Hawthorns was built for judicial official James Denham Pinnock before 1852. The asymmetrically composed two-storey house, with castellated walled courtyard and stables, is constructed of random coursed bluestone with slate roofs. Elaborate timber bargeboards and finials decorate the gables and the prominent chimneys are part bluestone, part rendered. The oriel, arched entrance and window surrounds are distinctive. The Hawthorns is an early house in the rarely-used Picturesque Gothic style, of architectural importance, and has an important townscape relationship to nearby 'Invergowrie', which is by the same unknown hand. A good example of its style, the house is conventionally planned and notable for its detailing. The entrance motif, with its tudor arch and oriel with a finely executed stone base, the surrounds to the west dormer windows and the castellated rear timber extension are distinctive. The Hawthorns is now enclosed by suburbia and has been altered over the years and lately been converted to flats. The original bay window and verandah have been unsympathetically replaced and some filials are decayed or missing.